Courtesy of the University of Florida Institute of Food and Agricultural Sciences, here’s a look at some financial resources that are available in the wake of a disaster. FEMA representatives will be available at the Project Impact City location to answer questions and register those whose homes, businesses, personal property, or vehicles have sustained storm damage and are in need of aid on Tuesday, October 15, 2018 from 10:30 a.m. to 4:00 p.m. Registration can also be completed over the phone (800-621-3362) or at www.disasterassistance.gov. Residents are eligible to apply for aid regardless of whether they are home owners or renters who lost personal property, and whether or not they have insurance. Aid is also available to those who lost a vehicle that is used for work or traveling to work. Your social security number is required to complete the registration process. In order to expedite payment for damages, have your banking information including your routing and checking account numbers handy to receive direct deposit. After completing registration, a nine digit registration number will be assigned. A FEMA inspector will inspect the property within 7-10 days. Be advised that inspectors may call from a non-local phone number. FEMA encourages you to answer the phone and check voice mails during this time. An inspector will only call three times, after which the case will remain in the system but will not move forward. After the inspection, the amount of aid will be determined based on the nature of the property damage and the applicant’s income level. After registering with FEMA, businesses and nonprofits are also eligible to apply for low-interest, long-term loans for losses not fully covered by insurance or other means through the U.S. Small Business Administration. The SBA offers affordable financial help to businesses and private non-profit organizations in declared disaster areas for damaged or destroyed real estate, machinery and equipment, and inventory and other business assets. The Emergency Housing Program is also in place to assist those whose homes are deemed unlivable in their present condition. There is never a charge for FEMA assistance or inspections. Disaster survivors are advised to beware of scam websites that require a credit card number in order to apply for aid. Please note that despite some local rumors to the contrary, FEMA does not distribute food vouchers. Check www.disasterassistance.gov for information on many different forms of federal disaster relief assistance. 5:00– 10:00 p.m. LIVE MUSIC AND FOOD TRUCKS! 7:00 p.m. Free Ice Cream Social as the Parade wraps up at Riverfront Park. 9:10 – 9:30 p.m. Fireworks! Awarded for our Independence Celebration! Apalachicola Main Street is proud to have our independence celebration placed on Trip to Discover‘s list of the 12 best celebrations in state! We cannot wait to see you at our’s this July 3rd! Enjoy not only the fireworks, but also food trucks, live music, and more! Click this link to see their webpage and list! 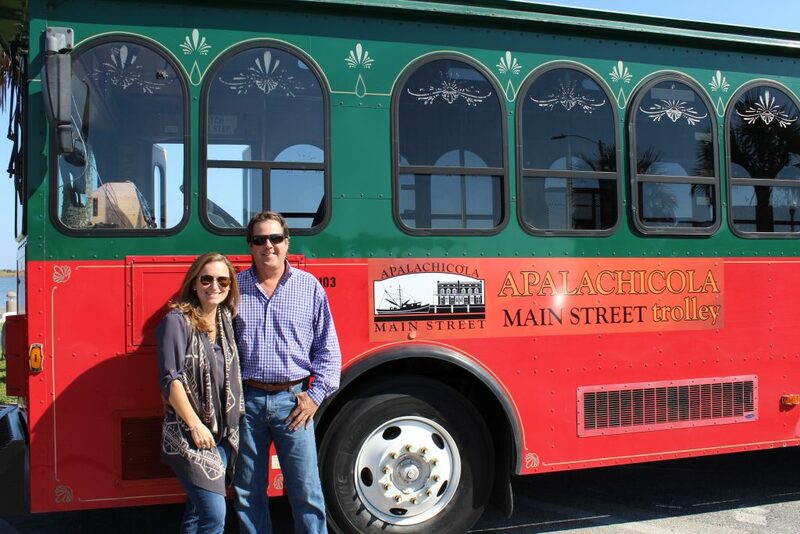 Beginning Saturday May 26, and continuing through Sunday June 10, Apalachicola Main Street is sponsoring Free Trolley Tours of Apalachicola. Tours will depart every Saturday and Sunday at 2 PM in front of the Raney House Museum, at 128 Market Street. Although the tours are free, tickets are needed to board the trolley, and will be given out on a first-come basis at the Raney House starting at 1:30 PM the day of the tour. The tour will go along the waterfront to battery park, then continue through the historic areas, up to the hill area, and over to Scipio Creek before returning to the Raney House. Along the tour route people will learn all about the history of the town and the many famous and infamous people who have played a role in the development of the area. They’ll also get some insight into little-known mysteries about town, some of the fun and unusual things that have happened here, facts about our fabulous nature and wildlife, and a glimpse into Apalach life throughout the decades. Tour participants will get to enjoy all of this while riding the comfortable trolley that holds 30-35 passengers. The tours are being held Saturdays and Sundays at 2 PM for three weekends, starting May 26 and ending June 10. They are funded by a grant to Main Street from the Visit Florida. Tours may be cancelled in case of severe weather. Questions? Call 844-272-2523.